A few days ago with the recently changes we introduced new functionality for users. Now you can fill your panel with duplicate auctions. Duplicating takes place at a time when the number of cells in the panel exceeds the number of users` active auctions. Our experience shows that fully filled panels look more attractive and more professional. 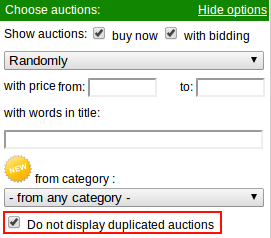 If you want disable this type of filling, select "Do not display duplicated auctions" in options of the panel.